If you love pampering your pet, you’re going to want to see these incredibly lavish beds. Some of these look so comfortable, you might want a big one for yourself. Some of the best naps happen in hammocks. Why not share that prime relaxation with your pet? This little hammock, meant for pets up to 25 pounds, has a wooden base with a soft bed that can be removed for washing when it inevitably gets covered in fur. Pampered pets will love this kiln-dried cedar double-decker bed, which has a cubby on the bottom and stairs that lead to a second bed up top. Both the top and bottom panels are removable to make cleaning a breeze. This sleek-looking bed-slash-statement-piece is perfect for the animal that appreciates modern furnishings as much as its owner. The 17-inch-diameter wire sphere is equipped with a comfortable faux fur and leather cushion. You might remember we wrote about a woman who knits blankets that are so large and chunky that she had to use her hands in place of needles. The designer also happens to make a pretty adorable pet bed that comes in a number of sizes and colors. The attractive beds are made with merino wool, so they promise to be extra cuddly. Orvis collaborated with Pendleton Woolen Mills to create this fleece bed—which mimics the black, yellow, red, and green stripes of its iconic Glacier National Park blanket—in honor of the National Park's 100th anniversary. Beep beep—one stylish dog rolling through! This possibly absurd dog bed looks just like a Mercedes Benz, if it was a plush toy. It has a fake license plate that says “LA DOG” if that helps seal the deal. Who says a dog bed can’t be an absolutely gorgeous piece of décor? This giant shoe—it's more than 2 feet long!—is fitted with a luxurious faux fleece insert that can be removed for cleaning. Two-hundred channels and nothing but dogs. This old console television was gutted and given a fresh coat of orange paint. Inside there's a plush bed for a small pupper to relax on, and on the top, there’s a line of kitschy rubber ducks. Let your pets kick back on a luxurious (faux) leather couch. The old-timey looking seat can comfortably fit two small to medium dogs. It comes pre-assembled and is easily cleaned with a damp cloth. Just like a human couch, it comes with wooden legs that keep it off the ground and accent brass nail heads on the back cushion. Cats and small dogs can now cuddle up in the mouth of a toothy fish. Suddenly Shark Week will seem a lot more threatening when your pet is about to be gobbled up by their bed. Cats are total narcissists, so of course they would enjoy sleeping in a bed that looks like them. 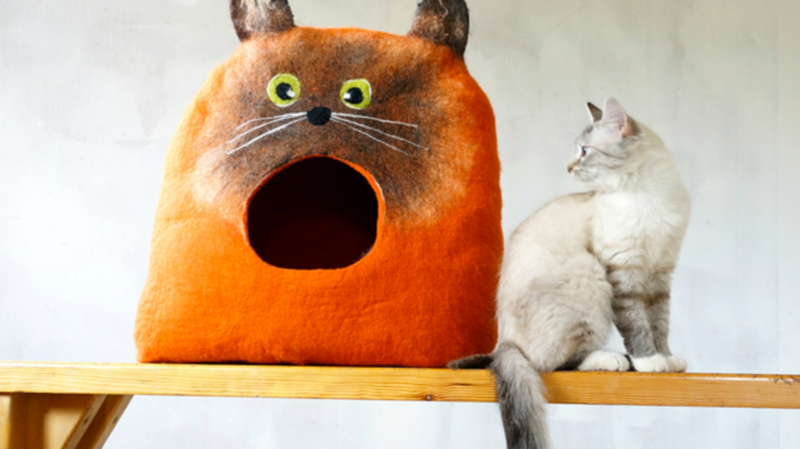 These quirky caves are handmade with merino wool; customers can pick between a variety of colors and sizes that best work for their pet.